Adding yet another feather to its cap, CCAvenue.com, the country's largest e-payment solutions provider recently bagged an accolade at the prestigious Indian e-Retail Awards 2017, organized by Franchise India. The glittering event was held on 15th May at the JW Marriott Hotel in New Delhi. CCAvenue received recognition for its powerful social commerce facility, CCAvenue S.N.I.P. under the 'Best Innovation in eCommerce Payment' category. 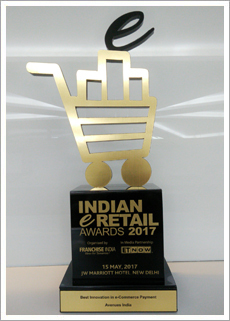 Now in its sixth edition, the Indian e-Retail Awards was conducted as a part of the Indian Retail and eRetail Congress 2017. It plays host to the who's who of the industry by offering them a unified B2B platform to discuss intrusive business insights and future vision sharing. This year, the exclusive 2-day event laid special focus on building a more immersive and seamless experience in consumer commerce, by bringing together leading minds, entrepreneurs, innovators and brands across retail, eCommerce and digital sectors. Through the esteemed e-Retail Awards, Franchise India recognized and rewarded entrepreneurs who have overcome challenges and made tremendous contributions to integrate omni-channel retail strategies, enhance user experience and drive business growth. CCAvenue was adjudged to have been the best in its category after a thorough evaluation by an independent jury of professionals and industry experts, followed by a rigorous voting process. The payment gateway bagged this award for the second consecutive year from Franchise India. Commenting on the win, Mr. Vishwas Patel, Founder and CEO at Avenues Group said: "At CCAvenue, we have always aimed to ease the process of online transactions for both merchants and customers, through our suite of innovative tools and services. CCAvenue S.N.I.P. is one of them. Nearly, 15,000 merchants have benefitted from the use of S.N.I.P. We are delighted to receive this accolade on such a prestigious platform. The award is a reflection of all the hard work that goes into creating the best-in-class solutions that help deliver a unified online payment experience. As CCAvenue continues to grow, we look forward to creating further disruption in the eCommerce industry and contributing to its positive growth". Being India's largest online payment processor, CCAvenue has always endeavoured to simplify and enhance eCommerce interactions by leveraging technology and in-house expertise. The payment gateway shall continue to introduce new business enhancement tools in the months ahead towards the attainment of this objective. In addition to the Indian e-Retail Award, CCAvenue has a string of noteworthy accolades to its credit including 'Digital Innovations in the SMB Sector 2016' at Digitizing India Awards, 'Skoch New Economy Award 2016' at Skoch Payments Award, 'Best Innovation in Payments & Transfers 2017' at the MoneyTech Awards, amongst others. Headquartered in Mumbai, CCAvenue is a payments platform for ecommerce businesses in India. CCAvenue is designed to help its 1 lakh+ merchants accept online payments through a spectrum of new-age payment options including 7 major Credit Cards, 98+ Debit Cards (All MasterCard /Visa /Maestro /RuPay Cards), Amex EzeClick, 53+ Net Banking, 48 Bank IMPS, 16 Prepaid Instruments and up to 12 Multi Bank EMI options. CCAvenue now also offers UPI (Unified Payments Interface) and will soon be adding BBPS (Bharat Bill Payment System) payment facility on its platform. Backed by a 15-year history of industry firsts, outstanding innovations and prestigious accolades, CCAvenue offers a multi-channel payment platform, along with a bunch of disruptive features such as CCAvenue Checkout, CCAvenue S.N.I.P., CCAvenue Store Front, CCAvenue Card Storage Vault (tokenization) and more. CCAvenue has successfully achieved the ISO/IEC 27001:2013 certification in addition to being PCI DSS 3.2 compliant.